regions of Central, West and South Asian regions. 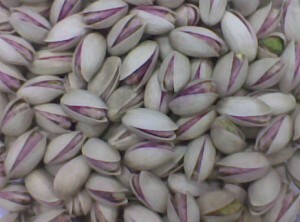 Pistachios are rich source of energy. In addition, they are rich in mono-unsaturated fatty acids likeoleic acid and an excellent source of antioxidants. Regular consumption of pistachios in the diet helps to lower total as well as bad LDL cholesterol and increases good HDL cholesterol levels within the blood. Research studies suggest that Mediterranean diet that is rich in dietary-fiber, mono-unsaturated fatty acids, and antioxidants help to prevent coronary artery disease and strokes by favoring healthy blood lipid profile. They are rich source of many phyto-chemical substances that may contribute to their overall antioxidant activity, includingcarotenes, vitamin E, and polyphenolic antioxidant compounds. Research studies have been suggestive of that these compounds help the human body remove toxic oxygen-free radicals and thus, protect the body from diseases, cancers, as well as infections. 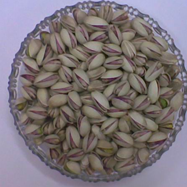 Pistachios are an excellent source ofvitamin-E, especially rich in gamma-tocopherol. vitamin E is a powerful lipid soluble antioxidant, essential for maintaining the integrity of cell membrane of mucus membranes and skin; offer protection from harmful oxygen-free radicals. These nuts are the storehouse of minerals likecopper, manganese, potassium, calcium, iron, magnesium, zinc, and selenium. Copper is an essential trace mineral that is required in neuro-transmission, metabolism, as well as red blood cell (RBC) synthesis. Pistachio nut oil features flavorful, pleasant nutty aroma and has excellent emollient properties. It helps to keep skin well protected from dryness. It has also been used in cooking, and as “carrier or base oil” in traditional medicines in massage therapy, aromatherapy, in pharmaceutical, and cosmetic industry. Pistachios nutrition VS other nut, fruit, or vegetable. 1- A one-ounce serving of pistachios equals 49 nuts -- more nuts per serving than any other nut and contains more than 10% of the Daily Value for dietary fiber, vitamin B-6, thiamin, phosphorus and copper. 2- You can get more dietary fiber from a serving of pistachios than a 1/2 cup of broccoli or spinach. 3- Pistachios are especially rich in phytosterols, which are directly associated with lowering cholesterol levels, and may offer protection from certain types of cancer. 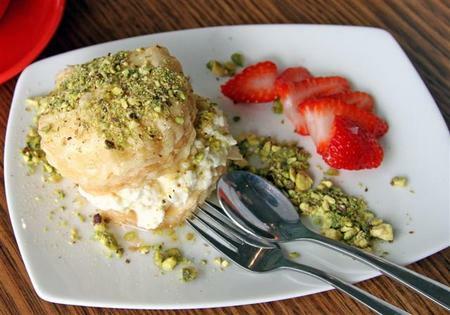 4- A serving of pistachios has as much thiamin as a 1/2 cup serving of cooked rice. 5- The amount of vitamin B-6 in a one-ounce serving of pistachios is comparable to a standard three-ounce serving of pork or chicken. 6- One serving of pistachios has as much potassium as half a large banana. 7- Pistachios are a very high quality plant source of protein, providing adequate and balanced amounts of essential amino acids. In addition, pistachios are relatively high in a nonessential amino acid, arginine, which may play a potential role in prevention or reduction of cardiovascular disease. 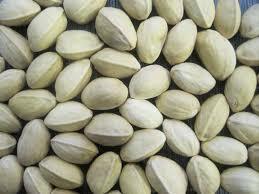 8- While pistachios contain fat, the fat is predominantly monounsaturated, similar to that found in olive oil.